Hagam community was cut off for nearly 2 years following 2015's catastrophic earthquakes. There has only been one route into the area, which is frequently cut off by landslides and adverse weather. 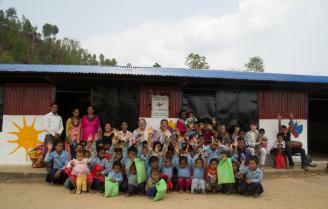 After an arduous and delayed journed we were heartened to see the school building has been finished. 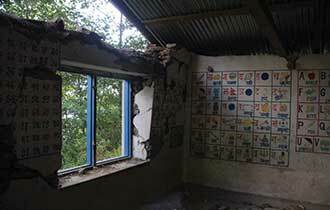 Through the generosity of a single donar, Kalinchowk primary school will have a new building to extend its capacity within the coming months. Just 2 weeks before our visit in March 19, up to 2 feet of snow had stopped progress but the villagers were quick to restart as soon as they could. Delighted to visit Shree Kalidevi school in March 2019 and hand over 10 computers to equip their IT room. Going forwards, the villagers have built a library but don’t have the resources to fill the shelves so we will aim to raise funds for books and resources for the older children. 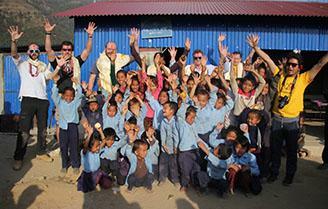 We are heading out to Nepal in March to visit all our schools. We will be delivering new Tin Boxes, new contents for boxes already in place. Books, stationery and uniforms we buy in Nepal but we can't buy Lego or Duplo easily. Both are fantastic resources so if you have any you could donate, we'd love to be able to take it out with us. Please get in touch if you can help. We collect it throughout the year. 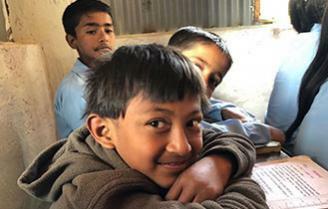 During our April/May visit to Nepal, Sarah G visited a number of school projects to check on developments and see what further support we can lend to each. Read her round up here. April 2018: With huge thanks to the 14 riders who took part in the inaugural e2eChallenge17 last year and everyone who sponsored their herculean efforts, we are delighted to have officially opened and handed over the shiny new buildings that make up Shree Mahendra Higher Secondary School in remote Likhu. 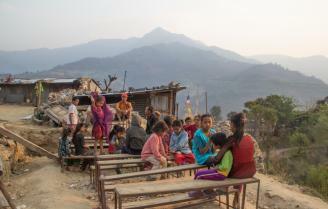 This community has been cut off for so long and subsequent monsoon seasons following the 2015 earthquakes have further compounded the problems and delays with rebuilding. 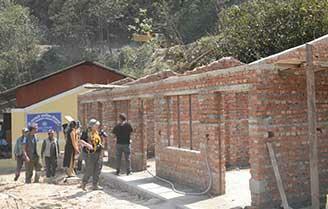 Now there is a fantastic new building complete with strong rooms and separate toilet blocks for girls and boys. A great achievement. We will share more news soon. After the mad dash to build a temporary shelter from the brutal monsoons of 2016, it was lovely to return in early 2017 and see the huge progress this little school has made. Together with an advanced part from Leadership Challenges, who are running e2e Challenge, later this year, we brought a jeep full of books, toys, classroom kits and games. 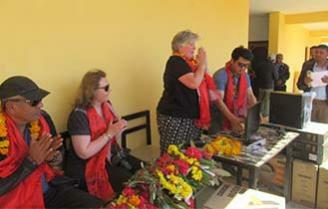 We even introduced rugby to Nepal during this visit! During our visit to Nepal in January 2017 we took the opportunity to revisit Ukhubari. We were given a wonderful welcome and a tour of the new buildings. 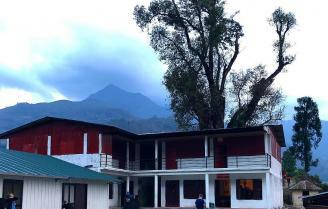 Two buildings house a preschool room, 5 classrooms, a computer/store room and the headmaster's office. The all important toilet block is just beyond. The buildings are now complete and so we are turning our attention to the land surrounding the school. Clearance an levelling will provide an useful playground; fencing will keep the children safe from the steep drops onto the terraces and a water pipe will connect to the village supply as rainwater harvesting does not quite fill their school's needs. We are working with the school to fulfill the next stage in the project. A year on and during our January 2017 visit, we saw the recently finished library/computer strong room and school admin office. The two rooms are big enough to accommodate a pre-school class too. 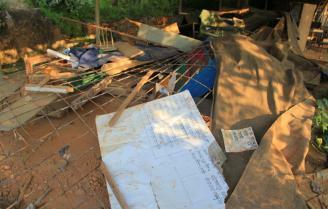 Next on the wish list is fencing around the site to ensure children stay at school during lunch break. They have a propensity to wander home during lunch and then don't return. We are delighted to be working with European School of Luxemburg 1 who have raised a substantial amount to enable this to wish to be granted. A party of D of E Gold students will be helping to build the fence in July. 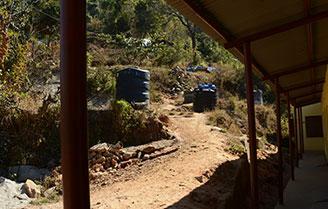 Mangala Devi school is our fourth project, a small school of 35 children. Too small to walk the long steep trail to the main school, it's in a remote area of Nuwakot that we came across during a recce trip in March 2016. 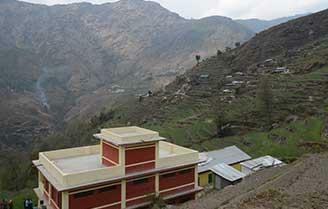 The school is just a set of tables & benches on a steep hillside without any shelter. We will fund 2 classrooms & toilets. Our target amount for this small project is only £6,500. It was hard to believe this school was just bits of bamboo in October 2015. Five months on the classrooms are all finished, we had a brilliant day dancing with the children as we celebrated the new school together. Thanks to everyone who helped us fund the building work. Ukhubari is spread along the contours of a ridge high above the Bhote Kosi river on the road to Tibet. The original school was built on borrowed land and no one was willing to help with rebuilding unless the community bought the land themselves. The village is mostly Mahji, a community of desperately poor low caste fishermen, and it was unlikely that they would ever afford to buy the land, so we stepped in to help. Through the Nepal River Conservation Trust we were able to negotiate to buy the land for them and handed the title deeds to the community in March 2016. Funding to build a new and bigger school that better serves the community has already been secured and building works are already underway.